The winter weather is here bringing with it the all too familiar sniffles, sneezes, coughs and fevers. To those uneducated about the wisdom of the body and its innate healing powers, the first thing to be reached for when cold or flu symptoms arrive is an antibiotic or over-the-counter medicine. Unfortunately what this does is take the healing process out of the hands of Mother Nature and puts it in the hands of man. While the symptoms disappear, who really benefits? Mom and Dad who are relieved because their child is no longer uncomfortable, or the child whose healing powers are diminished due to the drugs effects on the body? Our Creator, in His infinite wisdom, built us with many protective devices designed to work in specific situations and whose sole job is to work towards restoring us to health. Let’s take for example the runny nose and sneezing associated with the common cold. To stop a runny nose with a nasal spray is to deny the body the ability to rid itself of toxins through the nasal passages. When this happens and the mucus is not allowed to drain, these toxins remain inside of the body. Question – Where would you rather have them? Another common reaction is to break a fever. 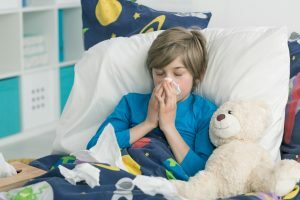 While a fever may be uncomfortable, it is rarely dangerous – in fact a fever is the body’s way of allowing an infection to be destroyed – through heat. Think about it, what is the first thing you do to a needle when you are about to remove a splinter – you heat the tip of it to kill any bacteria, which may be present on it. A fever is the body’s way of slowing down bacteria (the bad guys) so that the white blood cells (the good guys) can catch up to the infection and fight it. Over-the-counter drugs have a wide margin of safety as well as a wide margin of efficiency. Over-the-counter drugs do not cure illnesses; they simply alleviate mild to moderate symptoms. Today, many cough and cold advertisements target mothers. Robitussin, for one, uses ads that depict the mother as “Dr. Mom”. Many parents believe over-the-counter medications help their children sleep better but as written by Dr. Anne Gadanski in an editorial in the Journal of the American Medical Association, “many of these medicines contain sedating ingredients such as antihistamines or alcohol that promote drowsiness and sleep and have little impact on the child’s cold symptoms.” Physicians agree, a cough is good – it brings the mucus up. The cough is merely a physiological sign and we do not need to suppress it. With all health care professionals in agreement, it seems that the body has the best drug store around – and it’s built right in. One thing to keep in mind when your child has a cold or fever is how beneficial a chiropractic adjustment could be. Chiropractors address a serious problem called subluxation (a slight misalignment of a spinal bone which places pressure on the spinal nerves) which reduces the ability of their little bodies to fight off infection. At this crucial time, the body needs to be functioning at its best to restore normal function to the glands, organs and tissues of the body allowing free nerve/life flow. This can be accomplished by a visit to our office.